The front entrance leads directly into the living room which has a second door, leading to a hallway and staircase. 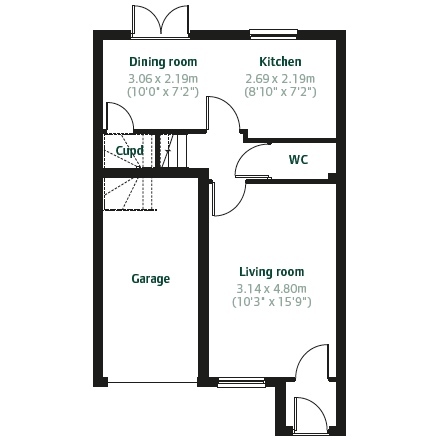 Off the hallway is a downstairs cloakroom and an open plan kitchen/dining room with garden access. 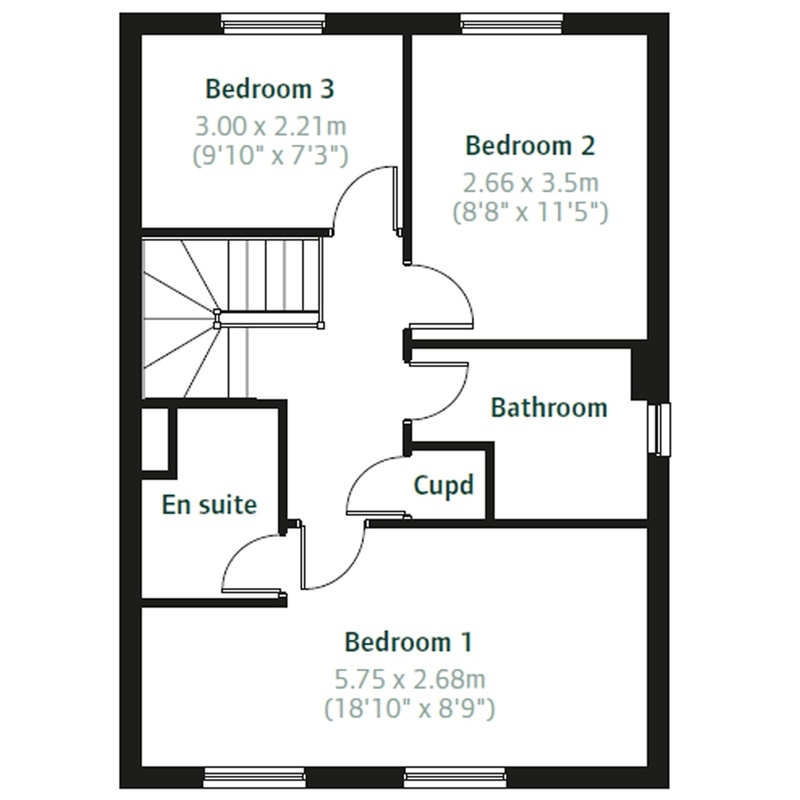 The first floor features a spacious hallway with a handy storage cupboard, a family bathroom and 3 bedrooms, including the master bedroom with en suite. 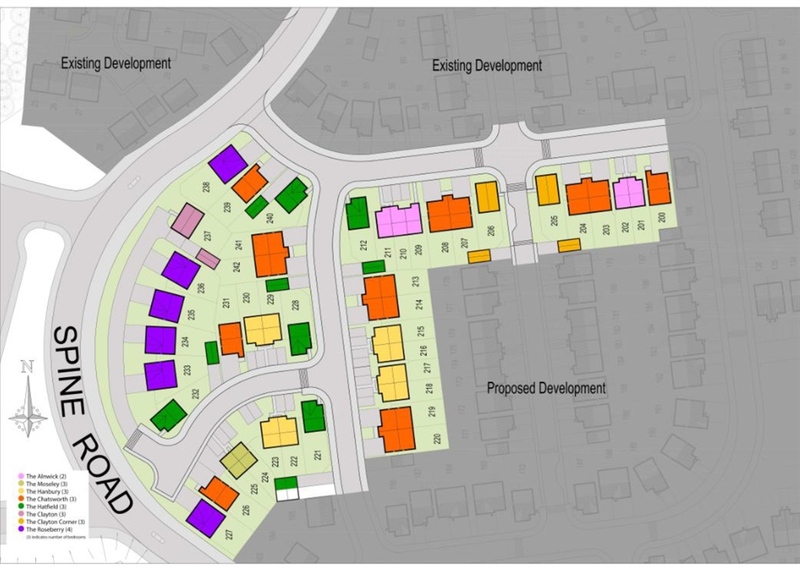 Maes y Parc is situated on the north west outskirts of Cross Hands -an idyllic setting for your new Persimmon home. Only a short drive from the town of Carmarthen, the attractive development at Maes y Parc offers the wide range of local amenities you'd expect alongside all the best that South Wales has to offer. The development offers a variety of quality accommodation, ranging from The Hanbury - a three bedroom home, perfect for first time buyers, to the luxury of The Chedworth - a four bedroom detached home with a study and an en-suite to the master bedroom. 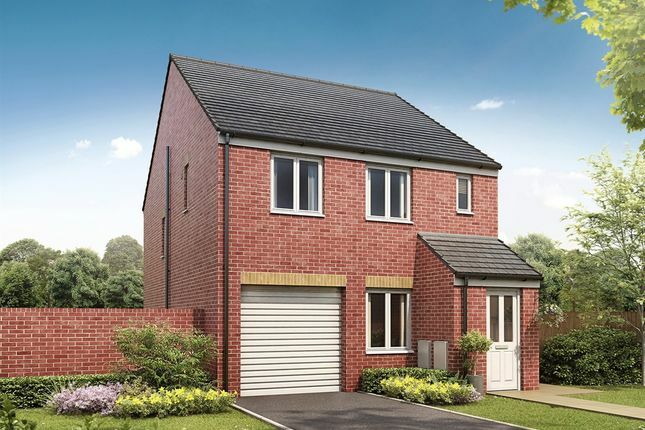 There really is a home to suit everyone at Maes y Parc with six different house styles including three bedroom terraced and semi-detached homes and three and four bedroom detached homes. All homes are complemented with either off road parking or a garage. Located in the village of Cefneithin residents of Maes y Parc will find themselves conveniently located between Carmarthen and Llanelli. Whether you're a first-time buyer, have a growing family or are looking to invest, Maes y Parc is bound to have what you are looking for. In Carmarthen there are cosy pubs and cafés, to town centre restaurants and bars there is entertainment to suit all tastes in Carmarthen. The town is also host to a lively music and theatre scene which is reflected in the variety of venues across the city, including the modern 665-seater Lyric Theatre. Nearby there's something for everyone from lazing on one of South Wales' golden beaches to visiting historic castles. Nearby the National Botanic Garden of Wales (pictured above) offers a host of family orientated activities including an adventure play zone, nature trails, picnic areas as well as a patchwork of garden, lake and woodland habitats. Llanelli provides a mix of shops with local shops and high street shopping. A little further afield there is Swansea only a 30 minute drive. Maes y Parc has good road links as it is near the A48 and A476, the M4 only a short drive away has access to West Wales and to the East Cardiff and Swansea. For train links Llanelli station has connections to Swansea, Cardiff and London to the East. Property descriptions and related information displayed on this page, with the exclusion of Running Costs data, are marketing materials provided by Persimmon - Maes y Parc, and do not constitute property particulars. Please contact Persimmon - Maes y Parc for full details and further information. The Running Costs data displayed on this page are provided by SmartNewHomes to give an indication of potential running costs based on various data sources. SmartNewHomes does not warrant or accept any responsibility for the accuracy or completeness of the property descriptions, related information or Running Costs data provided here.